Why use a Red Filter with your GoPro Hero5? Why use a Red Filter with the GoPro Hero5? Why use a Red filter underwater with my GoPro? To understand how a red filter works, it is important to understand the concept of how ambient, or natural sunlight travels underwater. Simply put, the deeper you dive, the less available sunlight you have to work with. Because light travels in wavelengths, the wavelengths decrease underwater according to the colors that make up the visible light spectrum. The first wavelength of light to be lost is red, because it comes first in the spectrum. Then, like in a rainbow, comes orange, yellow, green, blue, indigo and violet. An easy way to remember the correct color order is to memorize the spectrum by the acronym ROY G BIV. According to ROY G BIV, beyond a 10 foot depth, the remaining colors in the light spectrum also begin decrease. When we lose red light we also begin to lose orange and yellow. At about 35 feet, orange and yellow light are no longer visible, leaving green, blue, indigo, and violet. This is why on deep dives everything often looks very blue and green. The GoPro camera has an automatic white balance. You can think of the white balance as the cameras “color brain”. When you take the GoPro underwater the white balance thinks that all of the colors in the light are present. The lack of red light causes the camera to incorrectly record the colors, which causes excess blues and greens in your photos and videos. 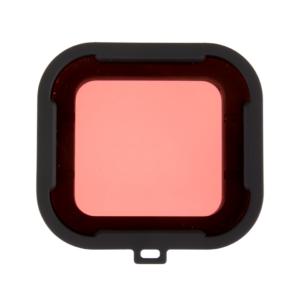 A red filter helps the camera to properly record vibrant tropical colors by reducing the excess blues and greens, and is a simple and affordable solution to help capture beautiful underwater colors of tropical fish and corals. Compatible with the GoPro Standard 40 meter or Dive 60 meter waterproof housings, PolarPro’s Red Filter is perfect for reef diving in the tropics, with a working depth between 15-80 feet. What GoPro camera settings should I use with a red filter? A red filter should have no effect on which camera settings you select, so we recommend filming in the modes you are most comfortable with. Be sure to keep the white balance on auto for the best color results. The PolarPro team likes to shoot in 1080 or 2.7K resolutions and at 60 or 120fps. Another helpful tip to capture the most accurate color possible is to keep the ocean floor or the reef in frame as a white balance reference point. If you’d like to experiment with your field of view, we suggest trying a medium or even narrow FOV. With these formats, you have less of a fish eye look to your composition. A narrower FOV will also allow you to keep your subject in focus at a greater distance, which is especially useful when documenting large marine life such as whale sharks or sea lions. For some situations, such as a shipwreck, the wide angle or super view formats will allow you to get the whole wreck in the shot from a closer distance. What if I am diving in green or fresh water? PolarPro also makes a magenta color filter, which corrects for the excess green colors in lakes with large algae blooms, or when diving in cold water, like kelp beds off the California coast. 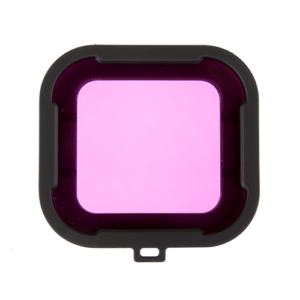 The Magenta Filter has the same working depth of 15-80 feet as the Red Filter. What about a filter for snorkeling? For those who like to snorkel in reef filled tropical waters, or even fresh water lakes, PolarPro has designed the Snorkel Filter with you in mind. A lighter hue of red than the Red Filter, the Snorkel Filter has a working depth between 2-15 feet, and is designed specifically for shallow water exploration, bringing out vibrant reef colors and adding contrast to your composition. As with any medium, capturing outstanding underwater content takes practice, and lots of patience. Visit your local dive shop for specific info regarding your local diving conditions, and get involved in your local diving community. Happy diving! © 2017 POLARPRO. ALL RIGHTS RESERVED.